The show team at CNN International's Connect the World might be a bit late to Facebook, but I guess better late than never. The primetime show has a brand new Facebook fan page which will give viewers and Facebook addicts an inside look at what goes on behind the scenes at the show. We'll bring you special video interviews with members of the show team and give you a look at what it's like to put together a program on CNN. You'll hear from host Becky Anderson on what it is like to interview some of the biggest newsmakers on the planet as well as some of the most interesting celebrities. You might even hear from the celebrities themselves! We'll also update the page with behind the scenes photos. From time to time you'll even be able to see what it is like being at an interview with people ranging from George Clooney to Pervez Musharraf. We've even just uploaded a video of a guided tour of CNN's London bureau. 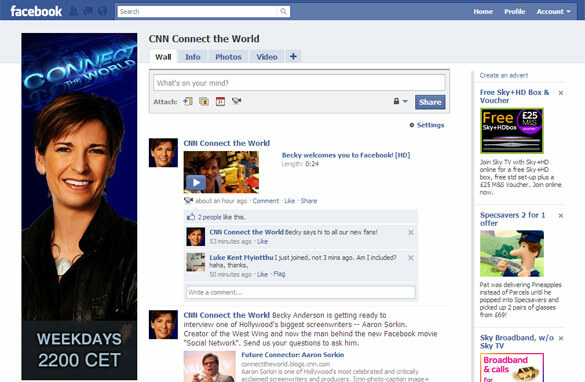 All you have to do is click 'like' on the page which is www.facebook.com/CNNconnect. It's as simple as that so make sure you connect up with the show on Facebook. Become a fan now and you won't be disappointed!